Although it was a hot, sunny day in Boston yesterday - I was in CT where it was a bit overcast and cloudy. There was just enough cool in the breeze for me to want to cook something special. 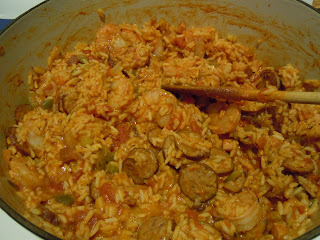 I had been craving jambalaya for a while - so I decided that this would be a great opportunity to make a big pot of it, and split the leftovers between Rafe and I.
I used Rafe's mom's recipe. 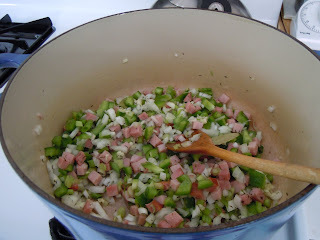 She grew up in New Orleans, and this is her recipe - so I can't give it out (family secret and all) but I can provide these pictures for a clue......and tell you that this recipe is close - if you add shrimp. The dish came out awesome - and I'm very excited to eat some of my leftovers for lunch today. Jambalaya is definitely one of those dishes that gets better as leftovers (like chili) since it has so many different flavors. They tend to meld together best after some time in the fridge. I think I did a good job....Rafe's mom came home just as it finished cooking and took a bite - I got very anxious - she knows her jambalaya. She said it tasted authentic, and I was relieved. The jambalaya sounds fantastic! I think its great that she shared her recipe with you...and that she thought yours was great! BTW, I left my camera cord at home so I'll try to upload the pictures tonight and email them to you! Michelle...I just ate it over some sauteed spinach (for greens :)....so good. Lots of Cayenne - I think you'd like it! Seriously! I read this and wanted to jump in the pot and swim around. It sounds so good! Munchkin - you just wait until I post what I made with the leftovers! Jack would love it! Nice job! Love that his mom gave her approval. So you'll be making this for the potluck? Ha ha.